I was afraid they’d say that. Now I just need to figure out the specifics of how to free my brain from the social media haze it’s slipped into. 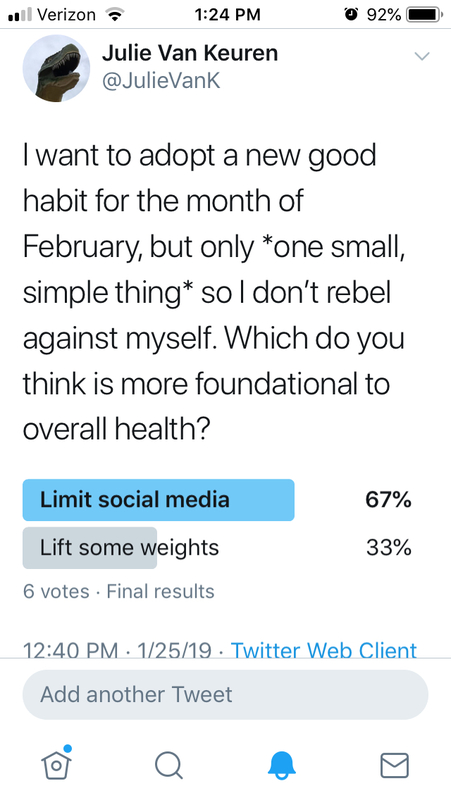 I’m not ruling out a monthlong “detox” where I never touch the stuff but am leaning instead toward trying to establish some sort of sustainable habit of not looking at social media until I’m done working for the day, for example, or setting a time limit on my phone. I really don’t want to, which seems like a sign that I really should. You hear a lot of talk about choosing a single word as a theme or abstract ambition for a new year, rather than making a resolution. Again, I’m trying NOT to overthink my life too much right now—which you will find pretty funny when I eventually tell you about all the things I did in the month of January—but I did get an idea for a word: CEO. The idea is that I am the CEO/yoga instructor/life coach/boss of my own life, which is literally true in the sense that I run a one-person business and also in every other sense. But I learned when I was training for the Ironman that it’s sometimes helpful to consult this imaginary person who’s in charge of you—asking for example, “If I were my coach, what would I advise myself about this?” It turns out that the imaginary-boss you often is easier on you than the real you would be on yourself, if you’re still following me here, and usually has some sensible advice. She also does not buy whatever excuse you’re trying to sell. I used this yesterday. It was late afternoon, which is always the witching hour for me, and I was mindlessly dinking around on the computer, feeling SO tired that I kind of wanted to lie down but with too much work on my plate to quit for the day. So I asked my inner life coach what to do. The answer came that I’d be perfectly fine once I got started (my work is only sitting and typing, after all), and that I just needed to decide exactly what to work on next, close all my browser tabs, step away from the computer for a moment to make myself a cup of (caffeinated) tea, and then come back and get right to work. That got me going again. In fact, I got super-focused on what I was doing and forgot to even drink the tea. Someday this blog may again become something other than “updates since I last wrote something,” but don’t hold your breath. I’m writing this on New Year’s Eve Day, but I certainly don’t have any plans to make blogging a resolution, or even to blog about the resolution I am making. I’ve had such a tendency to overcomplicate everything—not complaining; that’s my idea of fun—but I want to try not doing it for once and see what happens. Anyway, I was reading over my last few posts, many of which were a long time ago and all about how swamped I had been with work but how it was all going to get better at any moment, probably. That did not happen in 2018 until approximately December 20. (It was a lucrative year, at least.) We also took a couple of fun trips, got Mik accepted to college, and got M.H.’s fifth book out. So it was a good year in a personal sense. And, frankly, the apparent progress on the Mueller investigation has given me enough hope that lately I’ve been sleeping better and have been able to take a break from spending basically all my spare time angry at everyone and everything. If that trend continues, who knows? I may go back to regularly blogging frivolous nonsense for my own amusement. For quite a while M.H. and I have been “carb cycling” by eating them only on Friday nights, but some new reading on the topic recently suggested to me that that was maybe not the best pattern. Of course M.H. was doing fine on that diet, just like he does fine on every new thing I suggest, but he’s super-cooperative in going along with all my experiments. So together we decided to try instead spending six straight weeks eating low-carb and hopefully get into a ketogenic state, leading up to a family wedding we attended last Saturday. Being keto is supposed to make you feel amazing, and M.H. pretty much did feel amazing. I didn’t feel bad, but I didn’t feel great, either, and as you may remember I was having a hard time swimming and walking in the morning. So, anyway, the six weeks were over as of our car trip to the wedding, where we ate essentially whatever we wanted, including wedding tacos and wedding ice cream. I thought I would feel awful the morning after returning home, and I wasn’t really planning to swim. But it turned out that I was awake at 5:10 a.m. and feeling fine, and so I went. And the swimming went great, and the walk home was easy, and I felt fine and not at all exhausted the rest of the day. BECAUSE OF THE STUPID CARBS. Sorry if I sound like I’m talking gibberish, but I just wanted to vent, and if you care you can Google all these terms. I finally finished the final edit of M.H.’s new book, turned it into an ebook, and UPLOADED that baby onto Amazon. We decided to do a 99-cent promotion to get it into as many hands as possible, so you can preorder it now for that low, low, very special, limited-time price right here: https://amzn.to/2KZrPVn. It came as a shock to me, as I think I’ve mentioned before, how hard it was to get back into swimming (and walking, even), but I think I’ve got the hang of it at last. At any rate the cotton candy in my arms seems to have been replaced by something more effective at swimming. There are only a couple of weeks left in the team’s outdoor season, but I guess I can still go to the pool on my own, pay money, and swim if I want. I won’t, but if nothing else I need to at least continue walking in the mornings. I’ve rediscovered the wonders of infused water, and in particular the wonders of infusing it with lemon and strawberry slices. My adapted-to-low-sugar palate feels that this is basically a more refreshing version of strawberry lemonade. Finally, it is a new month, but I don’t see the point of declaring that I’m working on a new habit when there are at least four perfectly good other habits from previous months that I have failed to incorporate into my life in any way. 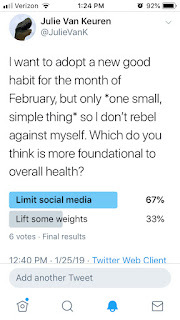 Some of them are very simple (“Start each day at the standing desk” literally requires only that I log into my computer from there) so I think I’ll just focus on actually doing the things I already said I wanted to do.